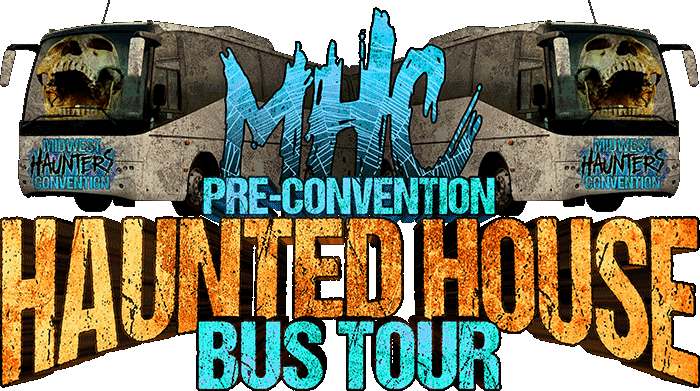 Early Bird Deadline Extended for Midwest Haunters Convention Registration & Pre-Show Haunted House Tour! EARLY BIRD DISCOUNT EXTENDED TO MIDNIGHT THIS SUNDAY (APRIL 6)! Dead Rising Haunted House is an old school, in-your-face haunt. They build all of their own props and sets for a uniquely terrifying experience.“Interactive” is the best way to describe this haunt. Both inside and out, guests are not only encouraged, but expected to participate in this unique harrowing experience! This is not your typical haunted house; you’ll enter in small groups then follow instructions as you try to riddle your way through and escape with your life. Midnight Terror Haunted House is a company with 20 years experience in the haunted house & entertainment industries. Driven by passion, MTHH has discovered what it takes to create something completely original, using “old school” tactics with a balance of “new school” technology, and extreme focus on making Midnight Terror an “actor driven” show! Midnight Terror’s expansive playground progresses throughout 26,000 square feet, more rooms than they can count, and actors in every spot they can fit. Explore the twists, turns, and tight spaces of “Factory of Malum”, which leads into the theatrics and special effects of “Black Oak Grove”. To finish off the Night Fear, you’ll then have to tread through “Chainsaw Alley”, an ending you won’t see coming! (Includes pizza and a beverage in the party room after your tour). The snow is finally melting, and the temps begin to climb out of the cellar. As the deep freeze releases its hold on Chicago, local Haunts are springing back to help their monsters and patrons warm up with some good-ol-fashioned fear! Pick your poison: un-Lucky Leprechauns or eerie Easter Bunnies? And from all of us at Haunted House Chicago, may your trip to Transworld be safe, may you find great corned beef and luck on St. Patty’s, and your Easter be filled with hocks of ham and green eggs! On March 17, 1819, a woman by the name of Abigael McDougan was burned at the stake by the early settlers of Hills Hollow, due to their belief that she was a witch. As she burned, she put a curse on the town of Hills Hollow that she would return. Time passed and the community forgot about Abigael and her curse. Hills Hospital was eventually built on the ancient grave yard that she was buried in. The evil energy from the torture of the patients has awakened her spirit and she has returned to seek her vengeance and has brought the demons of hell with her! The only thing stopping her from destroying Hills Hollow and the rest of the world is a group of Voodoo Shaman who are trying to send her back to hell. Travel through Haunted Hills Hospital and help them stop Abigael! The love of fright fills our hearts! As ice covers our land, Cupid’s zombie cousin flutters from its crypt once again for another holiday season of love and screams. Here’s a listing of all the attractions within 100-miles of Chicago that are producing special Valentine’s Day haunting experiences. Grab that special someone and get ready to share the love!